Welcome to the RCSDedcamp website! An Edcamp provides an opportunity for teachers with different skills, abilities, resources, and aptitudes to gather and exchange ideas and information. Edcamps are also referred to as ‘unconferences’; they take an untraditional approach to professional development in that there are no set presenters or topics for the day. People come to the event with questions, experiences, ideas to share, open minds, and a zest for learning, creating fertile soil for an exciting conference to bloom. The day starts off with participants expressing what they want to learn, using Post-its and chart paper. Then, participants look at the needs and wants of the group; some take on a facilitator role of one or more of the identified topics, and some stay in the participant role. Around the gathering area, there will be chart paper with designated room numbers and a time. If one chooses to be a facilitator, they will write the topic on a chart paper and facilitate the session in the corresponding room. If one chooses to be a participant, they will use the Post-its to attach their name to the sessions that are of interest to them. Sessions are usually around a half-an-hour and take the shape that participants want them to. The atmosphere at an EdCamp is comfortable and relaxed, so if a session you are attending isn’t for you, simply use the EdCamp "rule of two feet" and walk into another session—no one gets offended! The day is really what you make of it; you can facilitate, listen, share, network—the choice is yours! It all adds up to an engaging and exciting professional development experience. Looking for ideas that you can apply in your classroom the following day? EdCamp: it is a grassroots movement that is taking the education world by storm! Regina Catholic Schools is excited to host their first-ever EdCamp! The invitation is open to all school divisions. Come join us! An EdCamp is a FREE and innovative approach to professional development. It is designed for educators by educators, with the aim to empower teachers to drive their own learning and to foster professional communities of practice. Teachers' innate desire to learn, improve our craft, be agents of change, and become empowered are all part of this unique and refreshing PD opportunity called EdCamp! 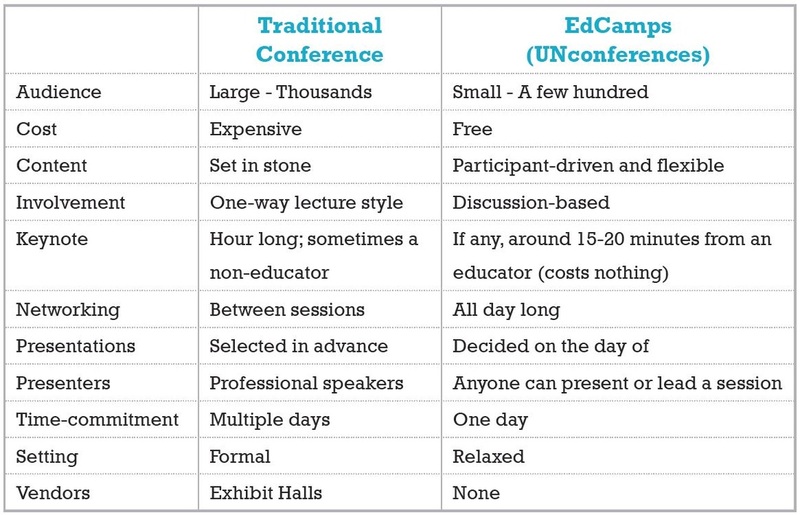 EdCamps are also called "unconferences". Sessions are developed on the day of the event, based upon the interest of the participants in attendance. Personalized PD at its finest! EdCamp is open, participatory, and the content is provided by participants--it's educators learning from other educators through sharing, dialogue, networking, and exploration of 21st century learning. Come with an idea, tool, trick, tip, project, or strategy that you feel other educators may benefit from. Also, come with a question or something you would like to learn more about. Come join us for a morning of sharing and learning! Educators teaching educators is the best PD of all! Invite your colleagues! The more people, the more sharing that will take place! This is an inclusive event--educators from ALL school divisions are welcome. Some confirmed participants at #RCSDedcamp are: Dr. Alec Couros (U of R Ed Tech), Joanna Sanders (Digital Literacy Consultant with the Ministry), Katia Hildebrandt (PhD Student U of R), and Kelly Christopherson (PhD Student U of R). How is EdCamp any different than traditional PD? "EdCamp is organized by groups of educators, specifically designed to create a participant-driven, fun-filled day of professional development. Educators can connect with like-minded individuals, collaborate ideas, brainstorm solutions to common education problems, have group discussions, and receive information that can immediately be applied in the classroom."